Simple Things: Baby wants a new bed - vote for Scout! Scout hopped right up on the bed for her modeling session. In fact she was so comfy we forgot she was there. Laura and I got to talking to folks standing around the area, but little miss priss did not move from her throne. She really wants her own bed! 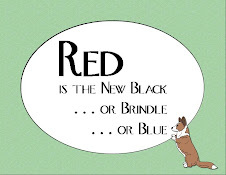 And - following in the tradition of her model-grandfather Sam (who is featured in Plow and Hearth catalog this spring), I pledge that if Scout is the winner, 100% of the prize money will be split 50-50 between the Cardigan Welsh Corgi National Rescue Trust and Corgi Aid. Here's how you vote - and I warn you in advance, the contest site is clunky. Go to http://www.dogpediccontest.com/ and click on "vote here". First you will have to register your name, email and a password. On the next screen you have to re-enter the email address and the password. Then you get to start looking for Scout. The picture above is the one I robbed off the site, but you will notice that pictures are in squares, so they squshed the girl up to fit into a square photo. As you move through the pics, you will will see Harvey yawning, keep moving, Scout is a few rows below him. One vote per email address. Voting goes on all of 2010. Please forward and crosspost as you wish! Or, grab the code for the button up and to the right! Ok, I did my part! I'll hit it with my Yahoo address tomorrow! I'm heading there now. Maybe we need to look into this modeling thing a little deeper? Could we have a whole family of canine models? Start an agency???? Janet, it's not working for me. I'll try in the AM when I'm more alert. That is a wretched voting process.